PPHS freshman Brandon Randolph (6) controls the ball during the Black Knights’ 3-1 victory over Belpre on Thursday night in Mason County. 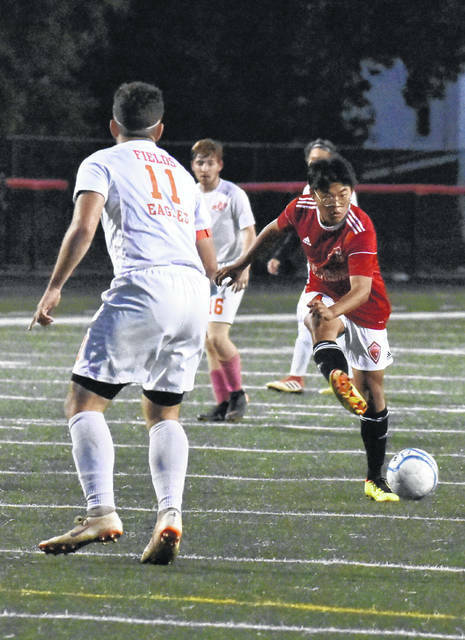 Point Pleasant’s Hajin Kim attempts a shot during the Black Knights’ 3-1 victory over Belpre on Thursday night in Mason County. POINT PLEASANT, W.Va. — Although the temperature made for a cold night, the Black Knights remained red hot. 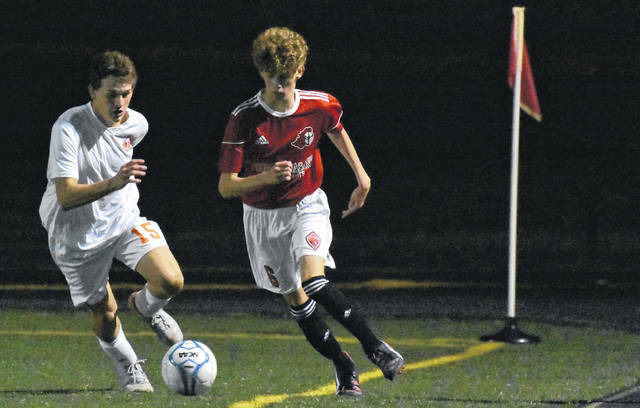 The Point Pleasant boys soccer team carried a one-goal advantage into intermission on Thursday night and never looked back en route to a 3-1 victory over visiting Belpre in a non-conference match in Mason County. The Black Knights (15-2-0) never trailed in the contest as the the hosts picked up their fifth consecutive win in a tightly contested contest. The Red and Black scored the first goal of the game a mere 42 seconds into play as Alberto Castillo scored — on an assist from senior Hajin Kim — to claim a 1-0 lead. From there, Point Pleasant widen its margin to 2-0 on an Adam Veroski goal in the 19th minute. Belpre’s Asaphe Santana narrowed the deficit to 2-1 when his free kick found the back of the net with 17:51 remaining until the break. Both teams were held without a goal for the remainder of the first half, as PPHS held a single-goal lead at the intermission. The two squads remained separated by just one tally for a span of 47:18. Veroski, however ended the scoring drought, when he netted his second goal of the contest — with 10:33 remaining in the match — to extend the Red and Black’s advantage to 3-1. From there, both teams were held without a goal as Point Pleasant closed out the two-goal victory. The Black Knights claimed an 22-10 edge in shots on goal and also posted a 5-2 advantage in corner kicks. Belpre senior goalkeeper Rawlin Barber finished with eight saves. In contrast, Point Pleasant’s Nick Smith and Zach Rediger stopped three shots apiece, respectively. The victory for Red and Black provided a season sweep of the Golden Eagles, having earned a 7-2 triumph on Sept. 4 in Belpre. In their two meetings this season, the two squads combined for a total of 71 shots on goal, with the Black Knights claiming a 40-21 edge. PPHS also claimed an 11-4 advantage in corner kicks, having earned a 6-2 edge in the initial head-to-head contest of the season. The team also celebrated Senior Night festivities prior to the start of the match recognizing Kim and Castillo. Following the game, PPHS head coach Chip Wood — who earned his 101st career victory — was pleased with his teams performance. “We did a great job of controlling the ball and working the ball around,” Wood said. “The really had their defense staked tonight with some of their more skilled and physical players. They gave us some challenges out there trying to beat them at the back. We weren’t able to play them as direct as we did in our first meeting this season, they had a lot of strength and speed on the back line in this game. Wood also was candid with how important the win was for his senior players. The Black Knights returned to Ohio Valley Bank Track and Field on Saturday to host St. Marys for their final regular season contest of the the 2018 campaign. Scott Jones can be reached at 740-446-2342, ext 2106.